UGENE helps bioinformatics activities at NSU | Unipro. Reliability. Quality. Intellect. 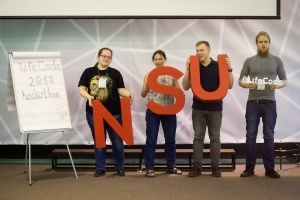 UGENE helps bioinformatics activities at NSU – Unipro. Reliability. Quality. Intellect. Last day of April 2018 Novosibirsk state university (NSU) held young scientists school on bioinformatics, where Unipro engineers participated with educational workshop, which helped to get basic skills on how to perform the most common genomics tasks in UGENE. That is sequence annotations, functional elements search, sequence alignment, etc. Subsequent second Hackathon on bioinformatics LifeCode 2018 started the same day and lasted until 3rd of May. Senior students and graduate students were solving various problems such as new protein compounds search, visualization and others. 9 teams participated in the final. Hackathon winners were gifted by several sponsors, including the UGENE project as well.